Nighttime Emergencies, How do You Respond? 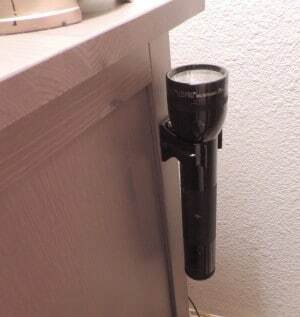 Here you can see a flashlight clipped to the side of the bed. When I worked in a firehouse, we always kept our turns outs (bunker gear) right by our beds. With everything always in the same place, we could be dressed and on our to way to slide down the pole in a matter of seconds. Later when I was on the arson unit, we often were called out at night. Over the years, I have built up the habit of always setting my clothes and shoes in the same place so that I can respond to nighttime emergencies. Placing my clothing in the same place allows me to find them in the dark, in case the lights fail to come on. The items that I carry everyday such as keys are in right pockets, so all I have to do is dress, no searching for anything. In addition, I have flashlights clipped to the side of the nightstands on both sides of the bed. These flashlights are also easy to locate, just remember to check the batteries occasionally. The same time applies to any weapons that you keep by your bed for self-defense. They should always be in the same place and in the same configurations. The other thing that I check is to make sure that I do not leave trip hazards around the bed. Habits free up our brains to handle issues that are more complicated. You don’t have to stop and analyze the simple act of tying your boots or turning a light switch on. These are things that you do every day without conscious thought. Being woke from a sound sleep and reacting quickly to nighttime emergencies is the result of training, practice and habits. Have someone wake you from a sound sleep and see how you react. Can you find your flashlight or weapons easily? As you can tell I am a creature of habit, but over the years, this has served me well. This entry was posted in security, Uncategorized and tagged Nighttime Emergencies. Bookmark the permalink. 2 Responses to Nighttime Emergencies, How do You Respond? You have written an article of the utmost importance, but will probably be ignored by most people. Not your fault, it’s just the way people are and I guess always have been. We have arranged our home and belongings including prepper supplies so as to know exactly where everything is when the lights go out, and they will, permanently! If you will allow us to take this one step further, if we don’t need it, we chunked it. That’s right, out in the garbage cans and off to the dump. Almost everyone in America, and we are no exception, had/have so much ‘clutter’ in the home, upstairs, downstairs, garage, patio, dresser drawers, etc. that we had to say an emotional goodbye to childhood items, old yearbooks, army stuff, and so on. Clutter is clutter and it is of no value whatsoever, in fact, it is a detriment to all things prepper. Without it everyone is better off and your mind is uncluttered too. Our motto is, “If it isn’t vital to survival then it’s vital to chunk it”. Thanks and God bless.